Lighting options from LEGO are limited. You have light bricks, Power Function lights and older, clumsy options like train lights and fiber optics. Luckily there's several aftermarket options to choose from, and now there's a new player in town, Brickstuff. I recently featured these lighting products on an Episode of BrickNerd and I've finally had some time to really experiment with them. 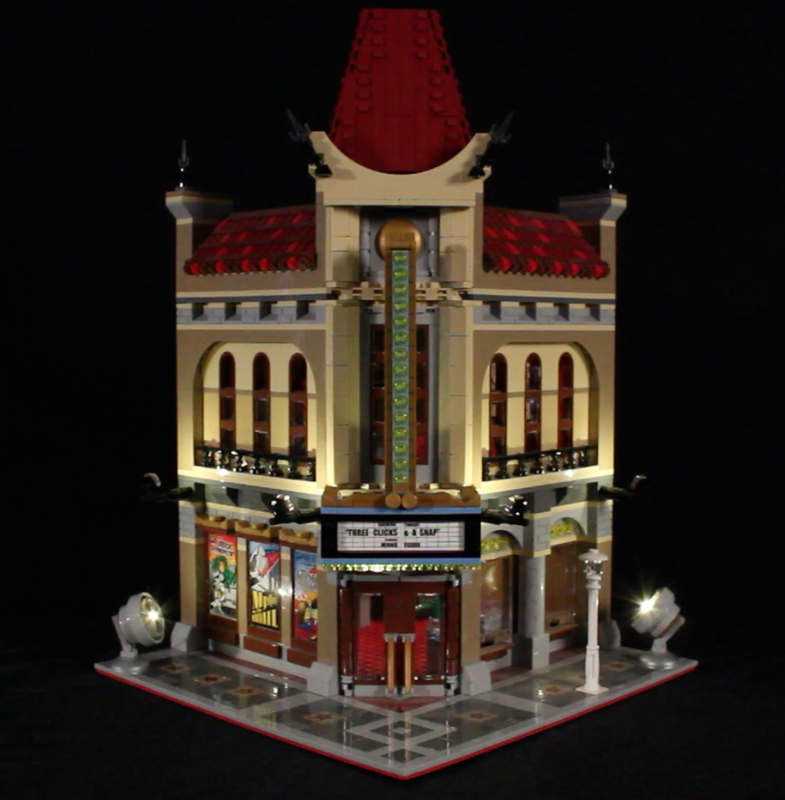 To really put them to the test I decided to challenge myself to lighting up 10232 Palace Cinema. The small external lights, internal rooms, marquee and search lights seemed like a demanding project (and I was right). It turned out great, thanks to the flexibility and adaptability of the Brickstuff products. I don't think I could have achieved these results with any other lighting product, at least not without major modifications. One of the main products are the tiny LED boards. They measure only 4mm across and have 12" thin wires and a tiny plug at the end. The light boards are small enough to fit inside 1x1 bricks or be tucked away into very small areas. The wires are thin enough that they can be routed through your MOC with relative ease. The plugs are tiny enough that they fit through headlamp bricks and Technic pins. This micro scale does come at a price though. The wires are fragile, during the course of doing this review I broke two of them, and let me tell you, repairing components this small is difficult. And if you've got sausage fingers like me (and fading, 40+ vision), you may struggle connecting them. My advice is take your time, be very gentle and never force anything. If it's not going easily, something just might break. Another major component to this collection is the LED Light Strip. This is a flexible, adhesive backed strip with two LEDs inside and a plug at either end. They are designed to fit perfectly on a 1x6 plate (which are included in the starter set, how cool is that?) and having the plugs at either end allows you to chain them together. You can connect as many as you need to get as much light as you need. But from my experience, you won't need as many as you think, these things are BRIGHT! For the cinema I only used one upstairs and two downstairs. I could have added more, but I didn't want the internal lighting to compete too much with the external lighting. I was thinking cinematically (sorry, I always do) if you primary goal is illumination so you can inside well, you will not have any problems with that. I've also seen a test of 100 of these lit from a single battery pack, that's a ton of light. The last major component of this collection is the 2 channel controller board. This is an electronic PCB with two power ports, two output ports, a switch, a button and a dial. You connect power to one end, one or two lights to the other and you're in business. The button allows you to select between twelve different functions on the board. Everything from airplane strobes to cannon fire and building explosions, and from flickering flames to alternating lights. It also works as a simple dimmer and has random functions. The dial controls the speed or brightness of any given effect, making it very flexible. The switch is for enabling a random mode, which I haven't really experimented with yet. The board itself is fairly tiny, and has four holes in it that fit snugly on studs, making mounting it a breeze. I wanted the marquee to have some life so I used this board to control the blinking lights under it. Yes, it would have been awesome to make the entire marquee light up, but that would taken at least thirty two lights (not to mention the rest of the cinema), I had eight, you do the math. I opted for a simple alternating light function, and dialed the speed to a pleasing value. So how do you connect all these fantastic things? That's another secret to the flexibility of this system. There are connector wires, ranging from 1.5" to 24" with plugs at each end. These plugs are considerably larger than the ones on the LED wires, which makes them a little harder to route, but a lot easier to connect. There's also a set of Y splitter boards that come in two flavors. One has a single large connector to two large connectors, the other has one large to two small. Using the connector wires and these splitters you can build your lighting circuit with ease and near limitless variety. This flexibility also comes at a cost. You will probably be surprised at the amount of wiring and splitter boards you go through very quickly. Leading to a bit of a wire management problem. The splitter boards also have no way to connect to the bricks. It would be great if they had a single stud hole so you could mount them some way. The picture below is the full wiring loom of the cinema, as you can see, things can quickly become a tangled mess if you aren't methodical. Luckily Brickstuff includes some things to help in the starter sets, like 1x2 plates for holding wires and double sided adhesive pads for connecting lights or boards. It's a delight to open a package and see that a company thought about how you would use their products and gave you everything you need. It's like opening a piece of flat-pack furniture and finding a screwdriver, it's just cool and thoughtful. One thing that would alleviate some of tangle and surplus would be 4 way and 8 way splitters. I could have used a 4 way splitter a couple times in this set up and eliminated a lot of the excess. I know Brickstuff has lots of other ideas brewing, hopefully that's one of them. Splitter "Y" cables would be handy too, eliminate a board for super simple connections. UPDATE: I just got word that if you wish very hard and eat all your vegetables (ok, maybe not the second part) your dreams might come true. Brickstuff just got in 8 way breakout boards (splitters). They literally came in today! Hopefully I'll get my grubby little paws on some soon. As a last little testament to the ease, scale and flexibility of this system, I decided to take a stab at lighting one of the micro scale modular buildings. I lit the micro emporium in less than 10 minutes with minimal modifications and it turned out great. I am truly impressed with this line of products, and I can't wait to see what else comes from Brickstuff in the near future. I also can't wait to try these in a MOC of my own. I've also had great communication and help from Brickstuff. It's a small company, but they're responsive and very friendly. A pleasure to deal with. Flexible, adaptable, expandable...so many options. Tiny, easy to hide and place. Thin wires hide and route easily. Controller board has a ton of options and variability. Included extras like adhesive pads and plates. Quality, this isn't some garage shop project, it's all top quality. Multiple packages and kits to choose from, as well as individual parts. Fragile, at least when you're as ham fisted as I am. Can be fiddly and hard to connect, those are some very small connectors. Somewhat expensive, but you're paying for quality.